Investment in EDI/HQ software and ERP system will pay off tenfold, says Tom-Cin Metals, a Wisconsin-based company with 30 years of fabricating experience. Results are in and 1 EDI Source, Inc. and Exact JobBOSS earn nine out of 10 stars in a recent client survey. Wisconsin-based Tom-Cin Metals praised the leading electronic data interchange (EDI) software firm and top enterprise resource planning (ERP) software supplier for saving the company time and money. Tom-Cin Metals also commended the software solution providers for delivering excellent customer service all while interacting seamlessly with each other. After making the decision to install a new ERP system, Tom-Cin Metals was hit with a new EDI requirement by its trading partner, Oshkosh Corporation, a top specialty equipment manufacturing company. Tom-Cin Metals needed: (1) an EDI software solution that complied with Oshkosh’s requirements and (2) an ERP system that could help the company effectively manage its capacity and utilization of resources. After only a few months of implementation, Tom-Cin Metals has found its new EDI software and ERP system are well worth the investment. With a 30-year history and a team of 60 employees, operational efficiency and order accuracy are top priorities for Tom-Cin Metals. Prior to purchasing solutions from 1 EDI Source and Exact JobBOSS, the company had major problems with overscheduling, inefficient data entry processes and inaccurate order handling. 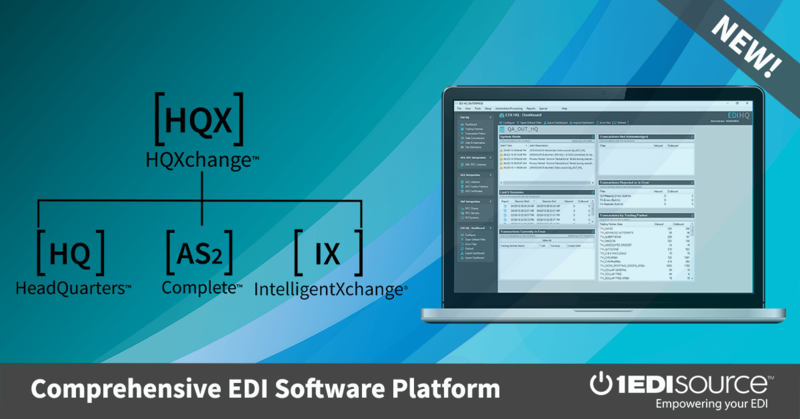 1 EDI Source’s EDI/HQ software, raising the bar on innovation, eliminates the need for manual entry, reduces transaction errors, and provides visibility into business transactions with customers and suppliers. The ERP system from Exact JobBOSS offers complete visibility, access and job control, which helps customers rest easy knowing the system delivers the tools to keep them efficient, productive and profitable. As a leading Electronic Data Interchange (EDI) solution provider, 1 EDI Source is a trusted partner of over 1,500 organizations. Our product innovation, customer service, and team of people passionate about customer success are the reasons we are a leader in EDI solutions. For more than 25 years 1 EDI Source has shown health care, manufacturing, retail, and transportation businesses that they should expect more from their EDI solutions. Exact JobBOSS is the most widely-used shop management system for job shops, contract manufacturers, make-to-order and mixed-mode manufacturers, and boasts of having thousands of customers worldwide. With over 30 years of excellence, Exact JobBOSS is the right solution for your shop by bringing confidence that our solution will grow as your business grows. Find out more at http://jobboss.exactamerica.com/company. Tom-Cin Metals is based in Hortonville, Wis. and has more than 30 years of fabrication skills and experience. What started as a focus on farm equipment sales, service and repair shop has grown into a custom fabrications company dedicated to supplying the best quality parts and service for its customers. Tom-Cin Metals is proud to say it is a made-in-the-USA, family-oriented business with great employees and loyal customers. Learn more at http://www.tom-cinmetals.com/index.html.